Carl Ray (Cree) was born and raised on The Sandy Lake Reserve, the same place where Norval Morrisseau and Joshim Kakegamic came from. This is the geographic birthplace of Woodlands School of Art. 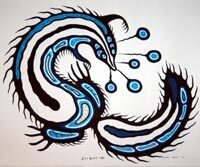 Carl Ray was one of the first native artists to show the secret legends of the Cree people in his art. He was the friend and apprentice to Norval Morrisseau, Ojibway Shaman artist, and together they painted the large mural for the Canadian Government for the Native People of Canada Pavilion at Expo '67 in Montreal. He had a unique x-ray style of painting, often showing the inner organs and energy lines inside an animal or man and presented his subjects often in turmoil with the elements. To Ray life was full of conflict and redemption. His art showed this struggle with Nature and Himself. Carl Ray was fatally stabbed at 35 years of age, at Sioux Lookout, Ontario in a domestic dispute in 1978.